The transport minister says he would like companies interested in a commercial service to come forward with their proposals. TRANSPORT MINISTER Leo Varadkar has encouraged private companies who may be interested in running rail services between the Republic of Ireland and Northern Ireland to come forward. The call comes after the government confirmed that it would not be seeking an extension to a derogation from EU law which meant Ireland had not liberalised its internal freight, or international passenger, rail services. 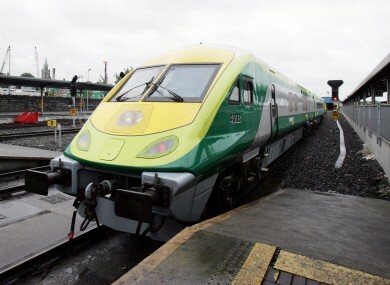 The move means that cross-border rail services – which are considered by the EU to be international passenger services – would be open to commercial competitors to Iarnród Éireann in twelve months’ time. “It remains to be seen in terms of level of interest that would be there, both to operate freight services and international passenger services,” Varadkar told RTÉ’s Morning Ireland this morning. The minister added, however, that he did not expect much update for the right to operate commercial passenger services, as “pretty much all our passenger services are loss-making” at present. “The only way you’d have a private company coming in to operate those would be to subsidise them, and it doesn’t make sense to subsidise a private company,” he added, saying he was keen to avoid the mistakes made by the privatisation of rail services in the UK. He went on to say that although there would not be much take-up for passenger routes at present, it was possible that interest would increase in future decades, as had been the case when Ireland liberalised its air traffic routes in the 1970s. Email “Varadkar would welcome private operators on cross-border rail lines”. Feedback on “Varadkar would welcome private operators on cross-border rail lines”.